This assessment examines the hazards, risks and control measures relating to Fire and Rescue Service personnel, the personnel of other agencies and members of the public when Service personnel are fighting fires in buildings. This assessment examines the hazards, risks and control measures relating to Fire and Rescue Service personnel, the personnel of other agencies and members of the public when fighting fires in domestic chimneys, including similar structures in other buildings such as public houses. It also covers false chimneys. This assessment examines the hazards, risks and control measures relating to Fire and Rescue Service personnel, the personnel of other agencies and members of the public when fighting fires in open rural locations including grass, moorland, crop and forest fires. This assessment examines the hazards, risks and control measures relating to Fire and Rescue Service personnel, the personnel of other agencies and members of the public when fighting fires in farms. This assessment considers the full range from smallholdings to large farms that undertake a wide variety of activities. This generic risk assessment examines the hazards, risks and control measures that relate to ventilation. It includes the use of positive pressure ventilation as either a defensive or offensive part of firefighting. Depending on the nature and scale of the operational incident, a variety of significant hazards may be present. Fire and Rescue Authorities may therefore need to consider the contents of other specific generic risk assessments in this series. 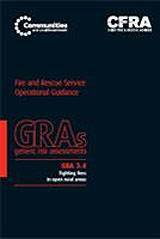 This assessment examines the hazards, risks and control measures relating to Fire and Rescue Service personnel, the personnel of other agencies and members of the public when fighting fires in refuse and refuse containers. This may vary from a fire in a small skip to one at a landfill or waste processing site. It also includes fires at unlicensed locations. The purpose of this assessment is not to address every conceivable hazard that may be presented, but to identify, evaluate and control the 'significant risks' which are specifically inherent with these particular incidents. The assessment is particular to firefighting, rescue or other operations, at locations where petrochemicals are processed or stored.